Why post a bird list from the middle of Seattle, in the middle of the summer? It’s usually a relatively slow time for birders. What makes this especially notable is its location – and the controversy surrounding it. Cheasty Greenspace is a 33 acre Natural Area in the Seattle Parks system in a part of town known as Beacon Hill. It is heavily wooded with second and third growth forest. Much of it is steeply sloped, and there are several wetland areas. There are also several slide prone areas. The area was protected, along with all of Seattle Parks’ Natural Areas and Greenspaces, by the 1993 City Council Resolution 28653: “Greenspaces, with their natural environmental character, will be used only for low impact activities, and will complement the City’s parks and recreation system where open spaces may be used in a more active manner”. Sounds great, until the Parks Department approved the development of a mountain bike skills course in Cheasty in January of 2014. The past two and a half years have been filled with controversy, and divisive community and civic events. The City Council got involved. Neighbor was pitted against neighbor, and people from all over Seattle wanted to have their say on the matter. In January of 2016, the Seattle Hearing Examiner reversed the Determination of Non Significance (DNS) filed by Seattle Parks, and said there was indeed evidence that a mountain bike park in Cheasty Greenspace could have a significant negative impact on the environment in Cheasty. Seattle Parks would be required to file a full Environmental Impact Statement, which they had never done. Six months later, people are still wondering what shoe will drop next. But the birds and wildlife in Cheasty are not waiting. They are moving on with their lives as they always have in the greenspace, thank you very much. During the debate on the mountain bike proposal, people spoke about the importance of keeping Cheasty a place that could continue to be enjoyed by people, via passive recreation, i.e, walking – and also keeping it a place where wildlife could thrive. So people naturally asked, well are there any birds there? What kinds? How many of them actually breed there? Answer: At least 23 bird species use Cheasty as breeding habitat. One of those who knows the area very well is wildlife artist and birder Ed Newbold. Here is his report. I went to Cheasty on three occasions in June, the last two with my wife, to see if I could come up with a likely breeding list of birds. We certainly missed birds. For one thing, even by the first trip the chorus of song was beginning to wind down for the summer. Violet-green Swallows We saw a significant flock actively foraging over Cheasty on each trip. This might not have seemed remarkable in the 1980s but Violet-green Swallows are becoming a rare-or-endangered bird in Seattle and are no longer reliably seen in the upland residential neighborhoods. If declines in insect-loads (“aerial krill”) are a factor in this bird’s plight, then it is very significant that the remnant population is concentrated in the highest-quality habitat. This bird is a Neotropical migrant. American Goldfinch (heard and seen flying in. Was present last year in the main wetland.) This is not a common breeder in Seattle. Pacific-slope Flycatcher Again, like last year, this aerial foraging mid-canopy specialist and mid-canopy breeder was present at multiple locations. A Neotropical migrant. 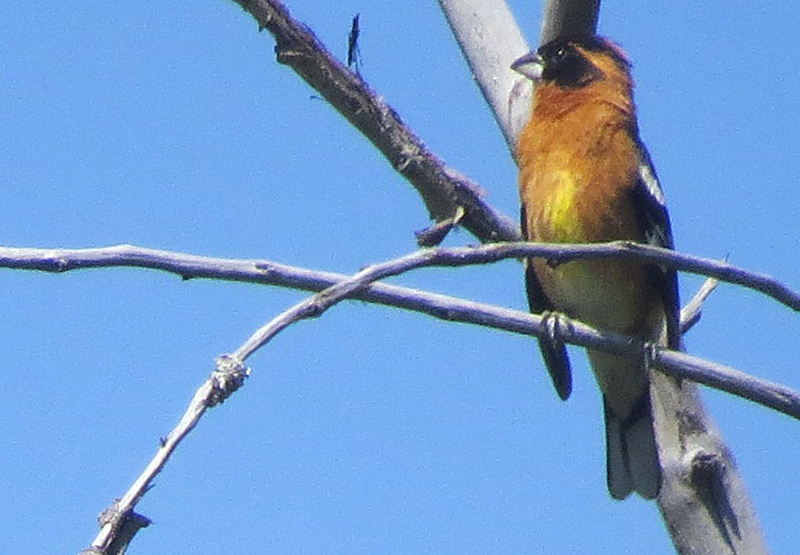 Black-headed Grosbeak (seemingly more than one bird vociferously singing and vocalizing on first trip.) Presence of this bird was presumed last year as fledglings were seen at the end of the breeding season. Young birds were at Cheasty at the end of last summer, however. A neotropical migrant. Warbling Vireo (multiple, hard to say how many there are, one of the commonest songs). I did not detect this bird last year, I suspect I just missed it. What a great breeding bird to have here, a Neotropical migrant. Birds like Warbling Vireos and Wilson’s Warblers ironically might do well at Cheasty precisely because of its smallness and isolation which may in turn make it poor area for the Brown-headed Cowbird, a nest-parasite that is perhaps their #1 enemy. Wilson’s Warbler Heard on all visits. A declining neotropical migrant. We thought there was more than one singing male. Orange-crowned Warbler We were surprised that perhaps two different males were singing near the heart of Cheasty. A neotropical migrant. Cooper’s Hawk (Ed Deal and others may long have known this but we saw near proof that the Cheasty Cooper’s adults are eating baby Crows. Huge Crow Commotion, then we saw the bird eating a charcoal-colored bird that was the right size. Took photos but accidentally deleted them with my new software). This family goes back at the very least 6 years in Cheasty, perhaps much longer. Rufous Hummingbird We were delighted to see this declining neotropical migrant. Downy Woodpecker This bird is again breeding in Cheasty. 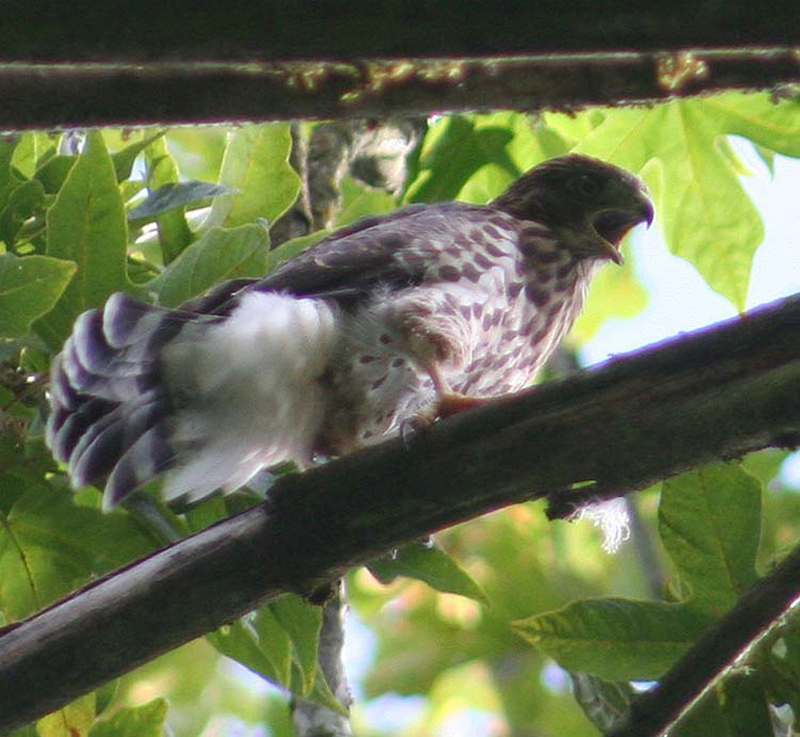 Doesn’t normally breed in the residential areas of Seattle, and is not at all common on Beacon Hill. 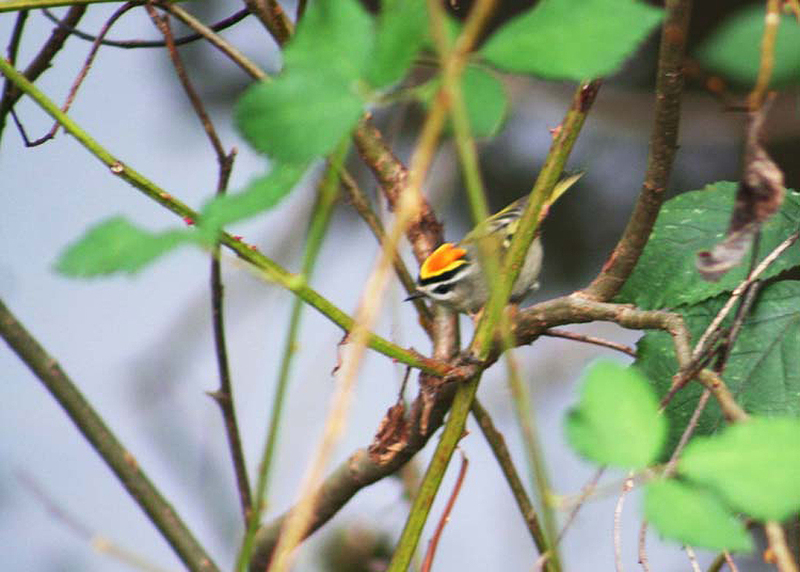 Golden-crowned Kinglet These birds were breeding, and to prove it, they had kids in tow on the last visit. Dark-eyed Junco A ground nester. Appears to be breeding in several locations in Cheasty. Bushtit We saw a flock headed in to Cheasty. These nest in the residential areas also. Also – a Western Screech-owl was observed near Cheasty again this year. 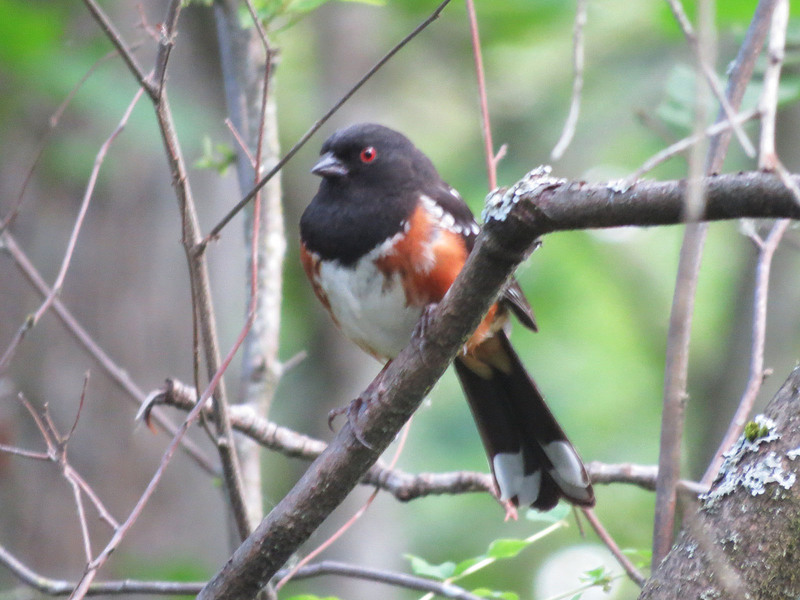 With the invasion of the Barred Owls, this is likely the rarest bird there and in fact may be in as much trouble now as the Spotted Owl around here. 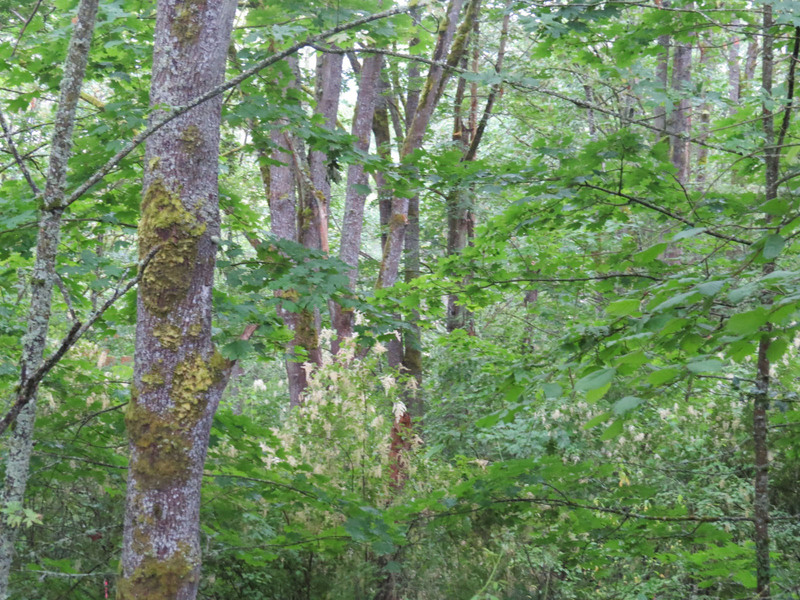 For example, Jamie Acker just informed me that there are zero Western Screech-owls on all of Bainbridge Island this year—and this is a place where they used to be common. Missed: don’t know why. Anna’s Hummingbird, these certainly nest in or near Cheasty, just missed it. Swainson’s Thrush. Slightly surprised by that, but heard no songs or call notes. Band-tailed Pigeon, Vaux’s Swift, Barn Swallow and Common Nighthawk have sadly all declined, or been extirpated from the area and were not seen. At least one Barn Swallow family hangs on this year in the greater-Cheasty area. Although there has always been ample evidence of Cheasty’s wildlife, Seattle Parks and bike park proponents have consistently dismissed Cheasty’s value for wildlife. SPR will prepare a revised State Environmental Policy Act (SEPA) Checklist and issue a revised “threshold determination” that evaluates the project’s impacts on wetlands, trees, and wildlife habitat as required by the Examiner’s decision. There will be a new comment and appeal period once the revised threshold determination is issued. Thank you, Mark! I appreciated your keeping us apprised. Good chatting with you at the West Seattle Fest. Thanks Arlene. The thanks really goes to Ed, who has stood for the preservation of this greenspace from the beginning.